Some of Liverpool's greatest fighting names over the years have come from the ranks of the little men - the bantams and flyweights. Ike Bradley, Stan Rowan, Joe Curran, Alan Rudkin and their like have gathered their full share of honour’s and limelight over the years, while others, despite fighting their hearts out in the highest class, have virtually faded into obscurity. Just such a man is Tom Burney, Tom, who never scaled more than 8 stone, crossed gloves with the likes of Scot, Terry Allen and Ireland's Rinty Monaghan, who both went on to win world titles as well as other fighters of the caliber of Joe Curran, Norman Lewis, Billy Hazlegrove and Bunty Doran. 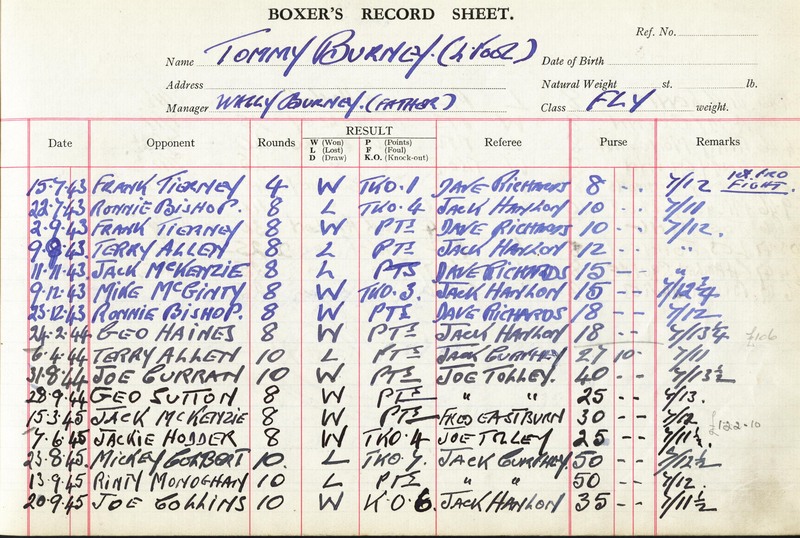 Tom was born into a fighting family for his father, Wally Burney, who was to become a well known Liverpool manager with Joe Curran as his star, had fought professionally at the-turn of the century as a flyweight under the ring name of Cockney Cohen. Wally opened the Leamington Amateur Club in Norris Green in the 1920s and young Tom was about six years old when he first laced on the gloves there. From their Leamington Road premises, the club moved to a stable in Cherry Lane then to a dairy in Hale Road. Finally, his father formed the Everton ABC with one of the best-known Liverpool gymnasiums of its era in Aubrey Street under Pepper's dance hall. For all his years in the amateurs, the only titles Tom picked up were in the Army during the war. He won the Western Command flyweight crown in 1942, but lost in the final for the all England Army title. He was 22 when he turned professional for his father in 1943, having packed in hundreds of amateur contests. Tom made a sensational professional debut. It was in July 1943, and he had gone to Liverpool Stadium as a spectator. A fighter failed to turn up and he was plucked out of his seat and paired with Glasgow's Frank Tierney. Remarkably, he knocked out Tierney in the first round but was brought down to earth on his next outing when he was stopped by Welsh Flyweight Champion Ron Bishop in four rounds. A woman climbed into the ring during the second round and started swinging her handbag at Bishop, Tom and referee Jack Hanlon. It seemed she had lost a packet on previous results and was determined to take it out on someone. They stopped boxing while the ring was cleared and when Jack Hanlon ordered “Box on”, Bishop seemed to come up from behind and caught Tom cold. He stayed there for two rounds knowing little about the fight, before His father threw towel in. 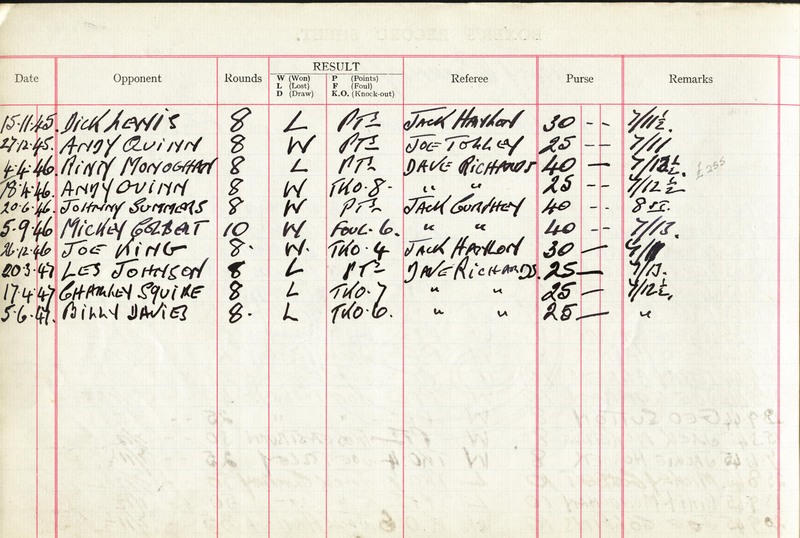 When he fought Joe Curran in 1944, there was a lot of talk about it because they were both managed by Tommy’s father. The fact was, Curran had just split with the camp and had gone with Tommy’s former trainer, Billy Walsh. It was a Stadium show August 1944, and Tommy wasn’t even down to box Curran. He was to have boxed Edinburgh's Tom Smith but when Curran was left without an opponent Tommy agreed to take him on. He had sparred with Curran hundreds of times and knew all his tricks and style so it was no surprise when Tommy beat him. Tom twice fought Terry Allen dropping two 10 rounds points decisions one a very close one despite conceding l0lbs. Tommy refused to accept the forfeit, because Allen was overweight. He was never really in boxing just for the cash rewards and, like his father, donated much of what he made out of the game to charity.